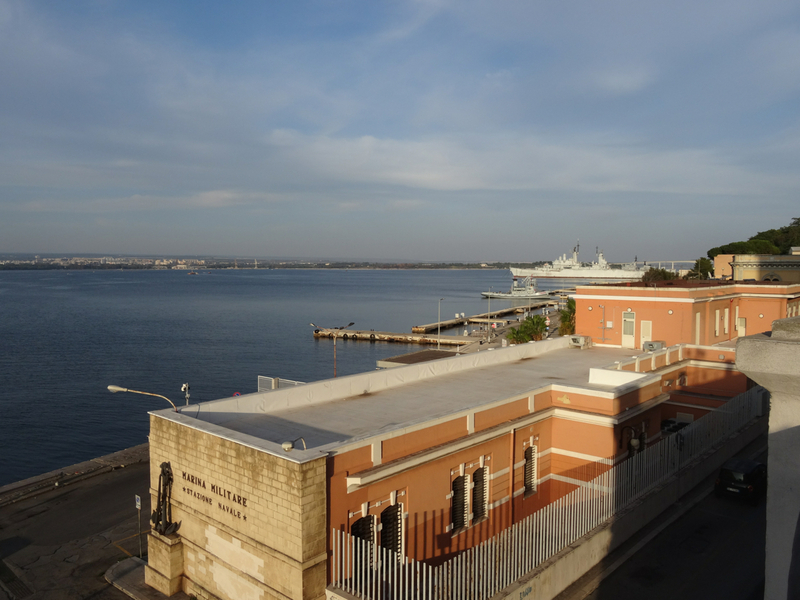 Taranto, “city of the two seas”, lies on the Ionian coast. Look down at the city from above and its the scoop of its lagoons, once famous for their mussel farms, that catch the eye. 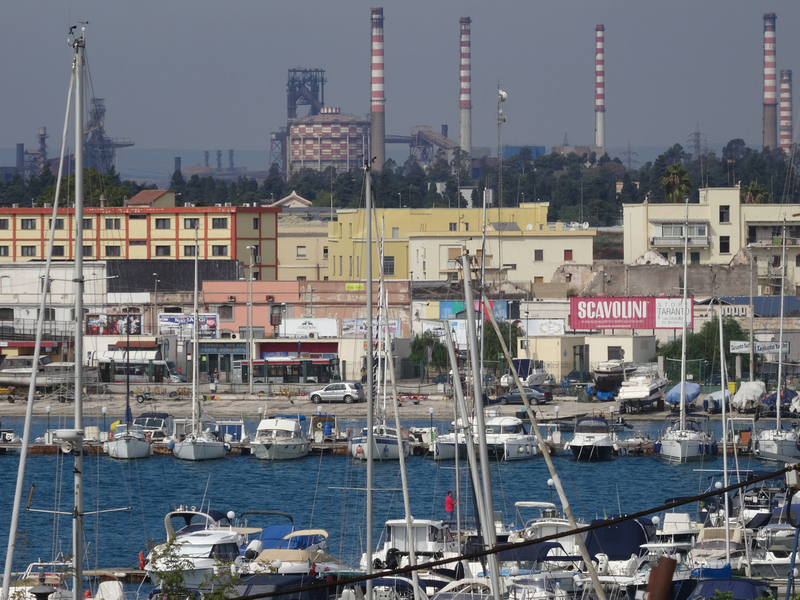 Our route towards the città vecchia takes us in through the consequences of a 1950’s political decision to turn this rural, coastal area into acres and acres of steelworks. 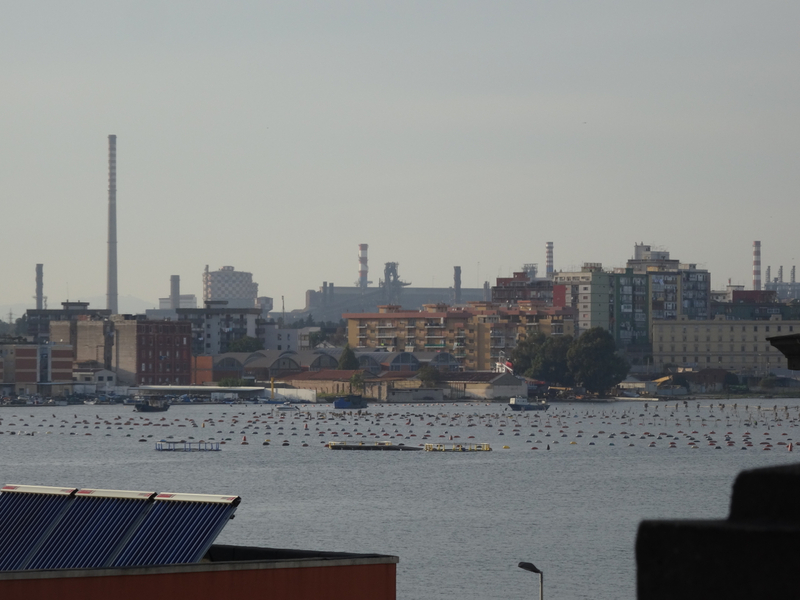 Instead of the olive trees we’ve grown used to, tall chimneys sprout amongst stiff metal frames. They stand in stained air above the frayed, tired outskirts of the city. Once on the seafront itself a better view stretches ahead. We find a car park where we are directed into a space by a tall man in a flourescent vest. Chiselled from the tombs of Sparta, he knows, and we know, that there is no-one better equipped to protect anything. Negotiation over the cost is not an option. 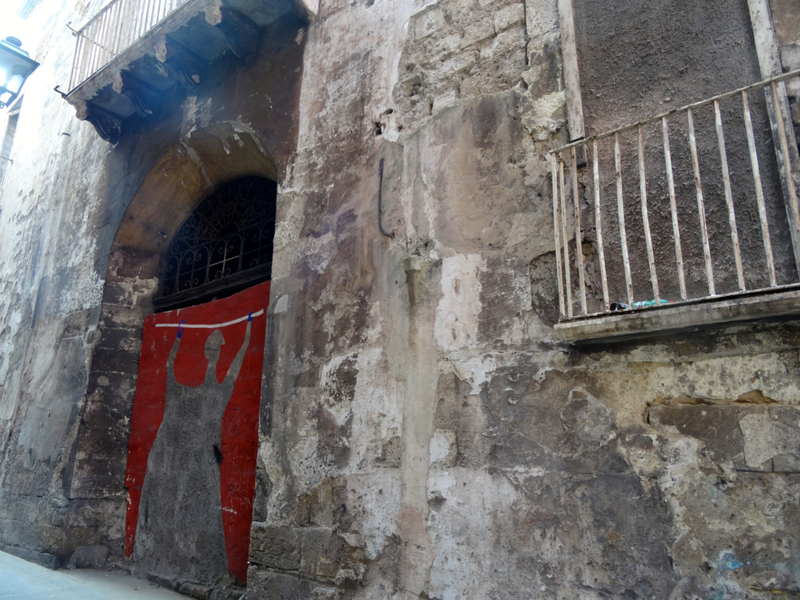 The old town feels familiar, similar in parts to the centro storico in Naples but the atmosphere is different. 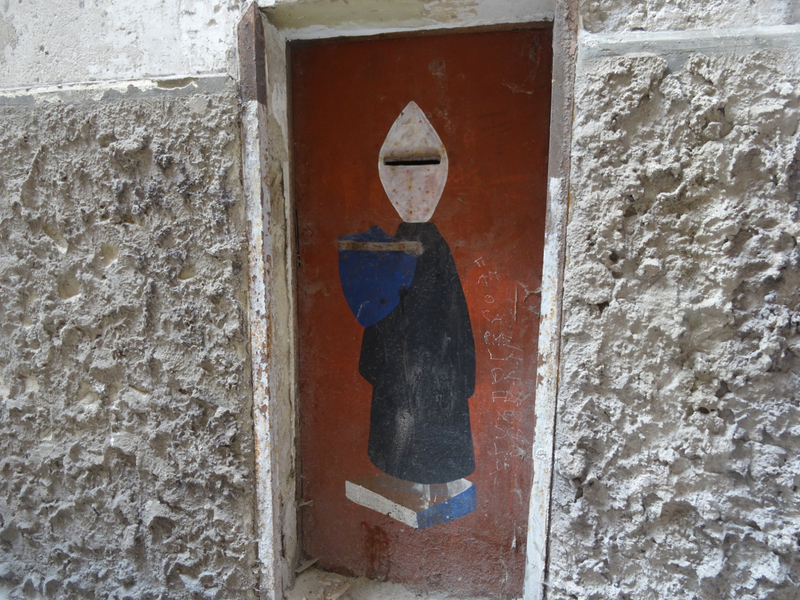 Naples is a river of life – in old Taranto the streets feel empty and uneasy. We pass a dark-doored bar with a few customers. Amongst them, large on a plastic chair, is our car-minder. We exchange nods, surprised, and move on … perhaps our backs are included in the price. A few families appear around corners but for the most part there is little other than echoes and the splash of a washing line or two. 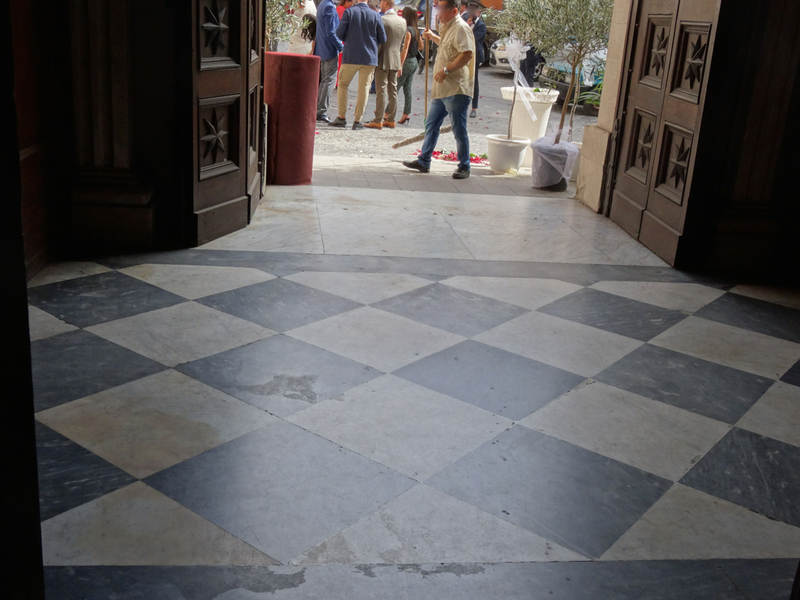 In the cathedral piazza it is different. There is a sudden burst of life with flowers, and the tail end of a well-dressed wedding. The cathedral doors are open for a few minutes while scattered rose petals are cleared from the entrance. 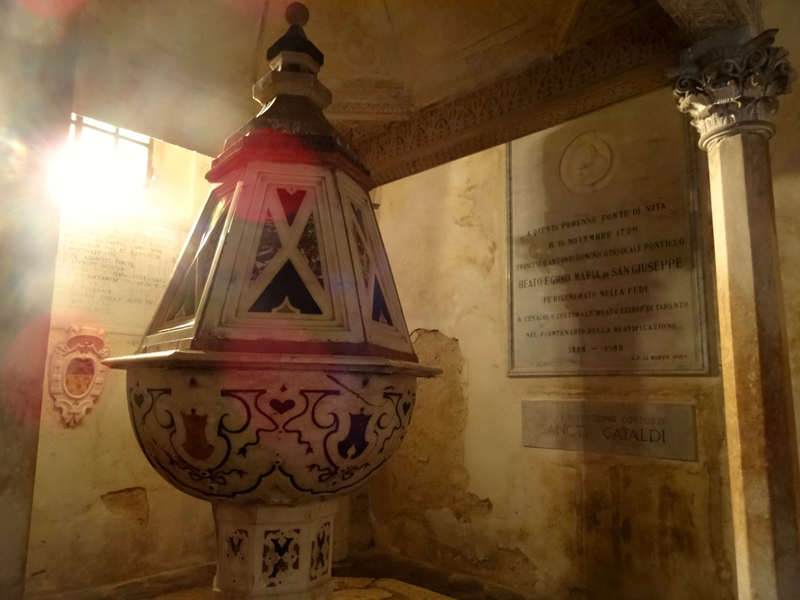 Immediately inside the large doors there is a small room to one side with a large, impressive baptismal font that stands under its own canopy. 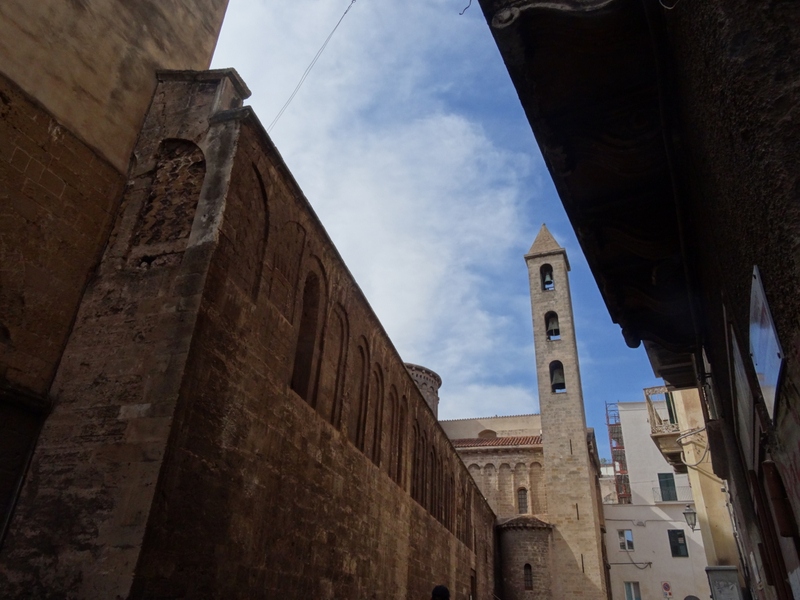 Beyond, at the far end of the church, is the chapel to Saint Cataldo, the Irish monk after whom the cathedral is named. 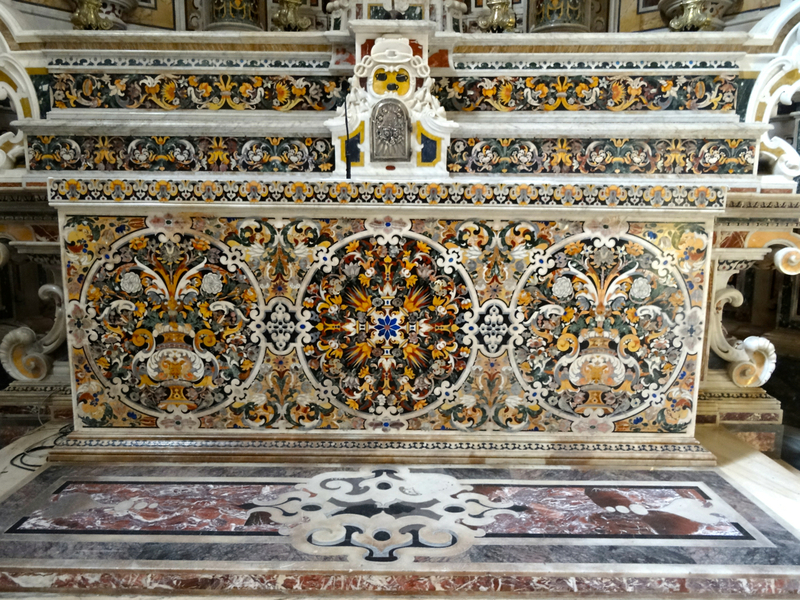 The small chapel is patterned in marble – intricate detail fills every inch of the walls, interrupted only by occasional pale statues, each perfectly preserved. This 18th century chapel is within the cathedral complex built by the Normans in around 1070. 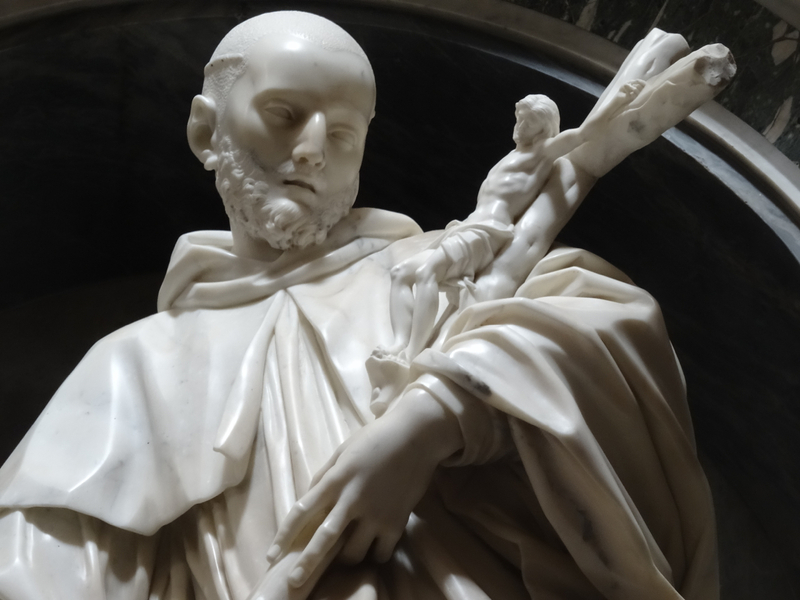 Both are in the name of Saint Cataldo who is said to have trained at Lismore in Ireland before he became Bishop of Taranto, the city where he died in around 550AD. The petal-sweeper enters the building. His keys rattle as he runs his final checks. 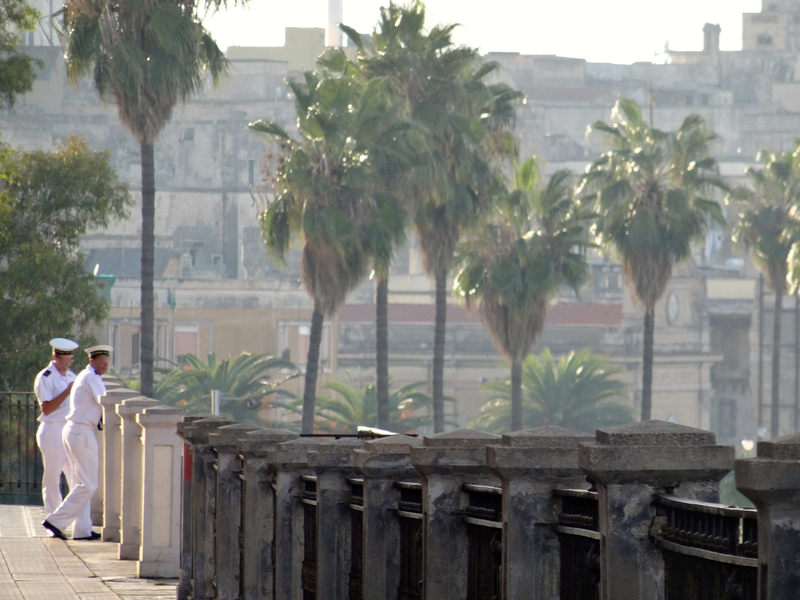 I exit a few seconds ahead of him to continue our wander through old Taranto. 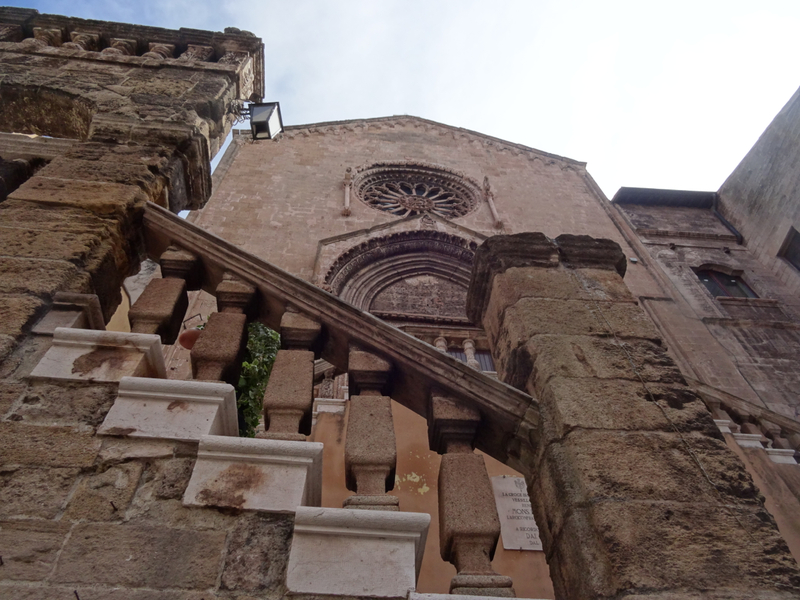 The old city’s other highlight is the church of San Domenico Maggiore. This building, raised above the street and almost within sight of the sea, is shut by the time we find it. It’s close to the seafront, and the relief of the open air is made all the more precious after a tight shave with a male-loaded motorbike in an empty alley. The wide road above the bay gives us our first sight of the sirens perched on the rocks in the sea below. Their story, like the city’s, has been complicated by suitors. Taranto has had many admirers. It was the Spartans in the 8th century BC who arrived first. 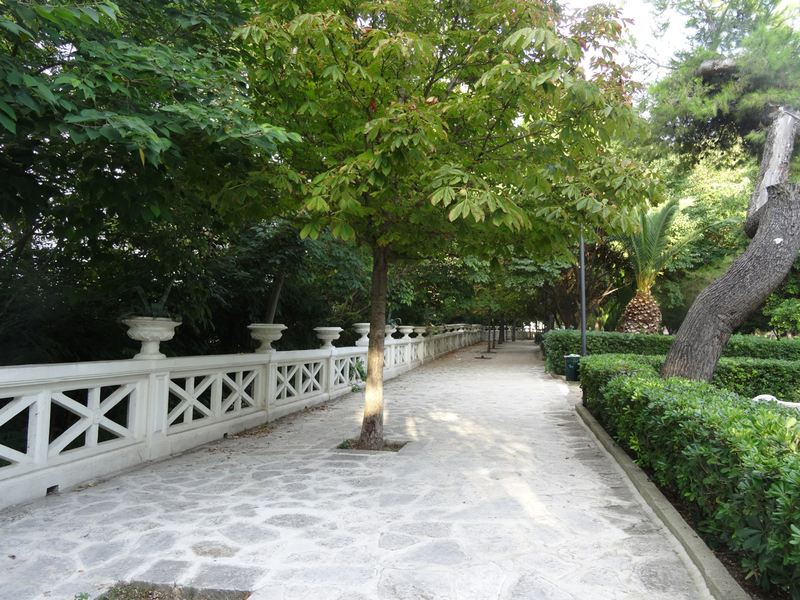 They founded Taras – beautiful, confident, and once the wealthiest colony of Magna Graecia. Success attracted fresh suitors, some more violent than others. They came, they left, and occasionally returned again: after the Greeks came the Romans; then the Byzantines; followed by the Normans; the Longobards; the Arabs; the houses of Anjou and Aragon; the Turks; the Bourbons; the French; Garibaldi and a united Italy; the bombs of the Second World War … and then industrialisation. Little wonder that today’s Taranto looks tired. It’s also no surprise that she’s tried to protect herself. The curved belligerence of the castle on the edge of the old city is irresistible. 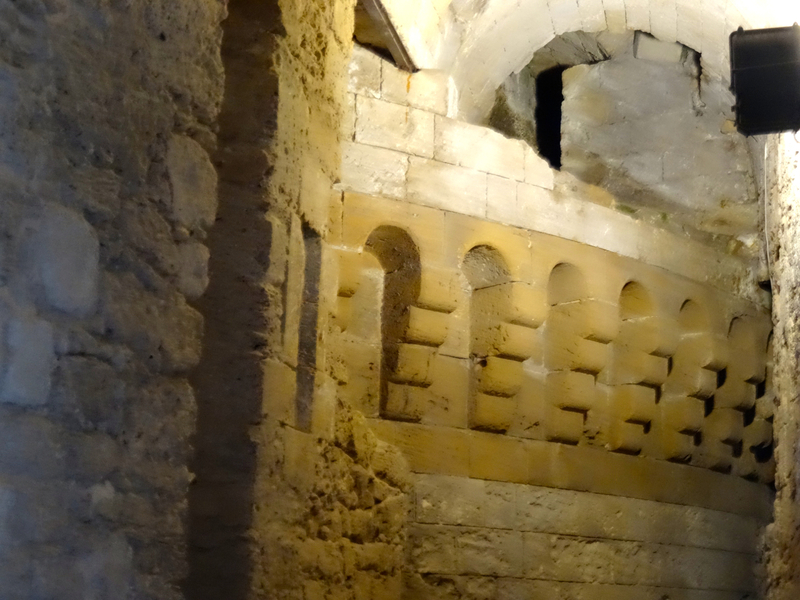 Excellent, free guided tours cover the history of the castle and plans for its future. Our guide is an enthusiastic expert on the design of the building and the threats it has faced. He takes us deep into the foundations of the castle and down to the water’s edge. 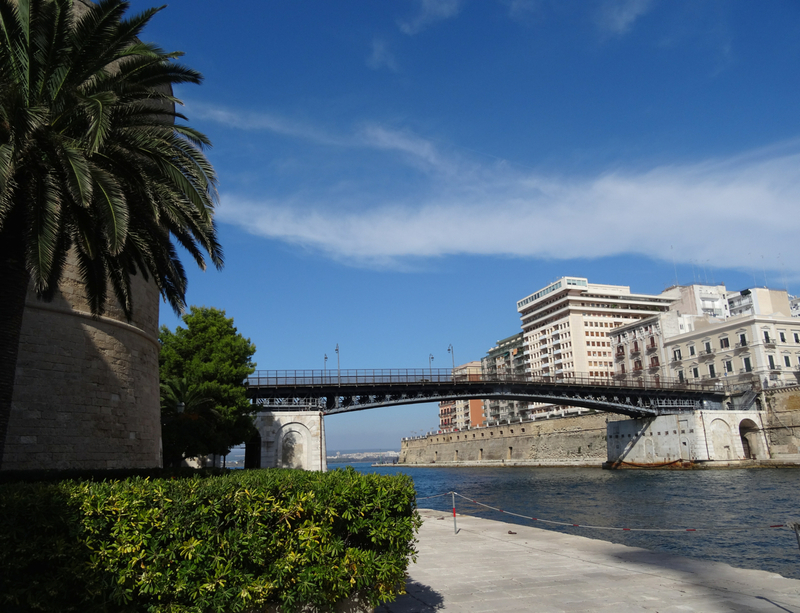 The tour ends with a technical discussion about the canal that joins Taranto’s mar piccolo to its mar grande, and that runs beneath the bridge that links the old city to the new city. The new city, on the far side of the bridge, looks and feels different to the old city where we began. 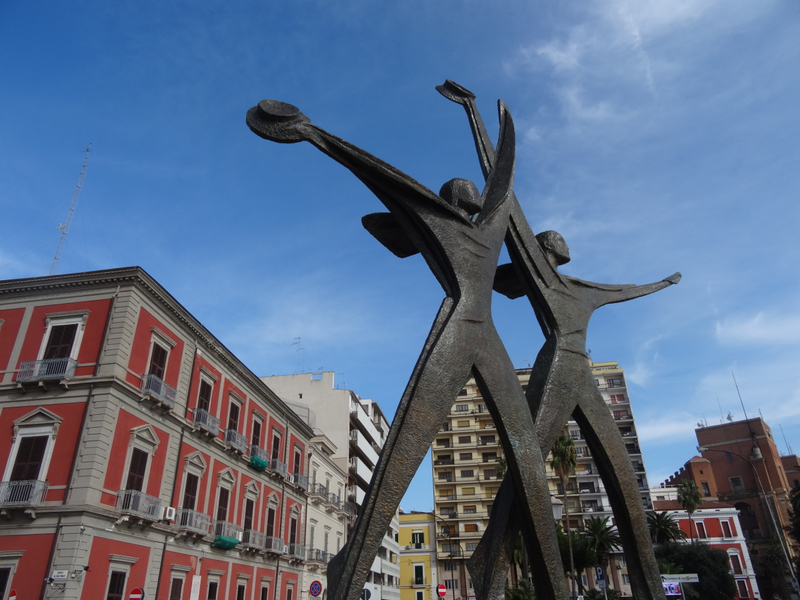 Two giant figures stand at the end of the promenade with their faces out to sea and their arms raised – a shout of welcome perhaps? 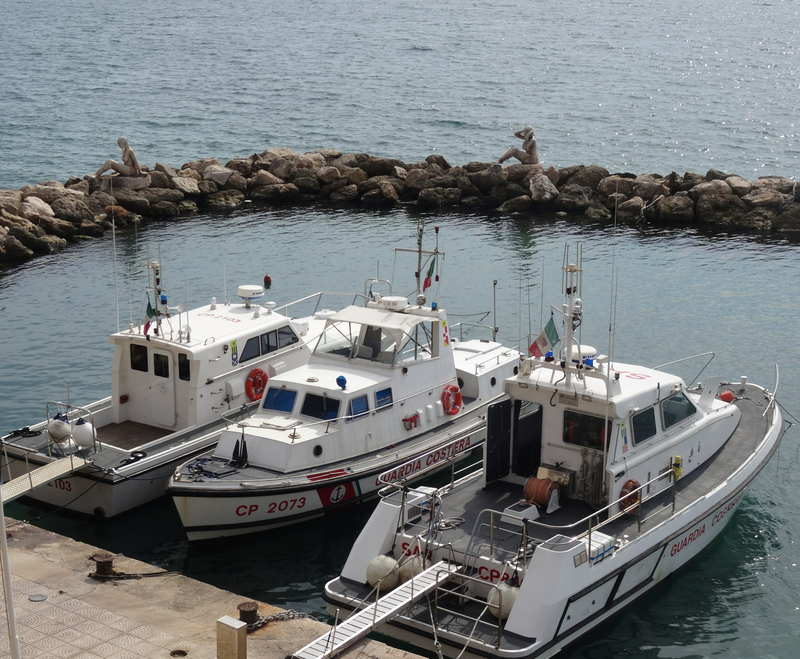 The inscription on their base remembers the Italian naval personnel who died in the Second World War between 1940 and 1943, a date range that includes November 1940 when the Italian navy was destroyed in the bay by English bombers in the ‘Battle of Taranto’. Seen from the opposite side the shout of welcome becomes a cry for help – the gesture more of drowning than waving. 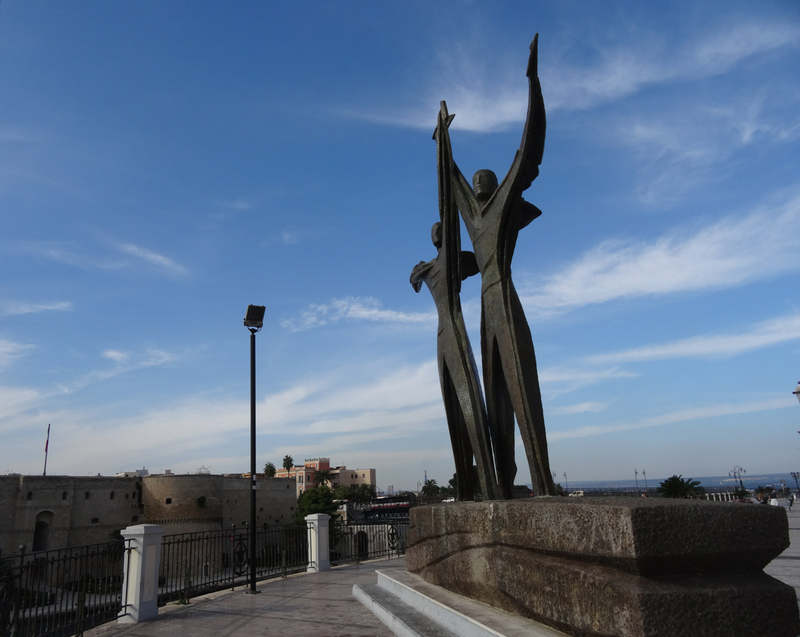 The sculptor is Vittorio di Cobertaldo and his Monumento al Marinaio d’Italia is one of the most memorable public sculptures I’ve seen, and the location is perfect. 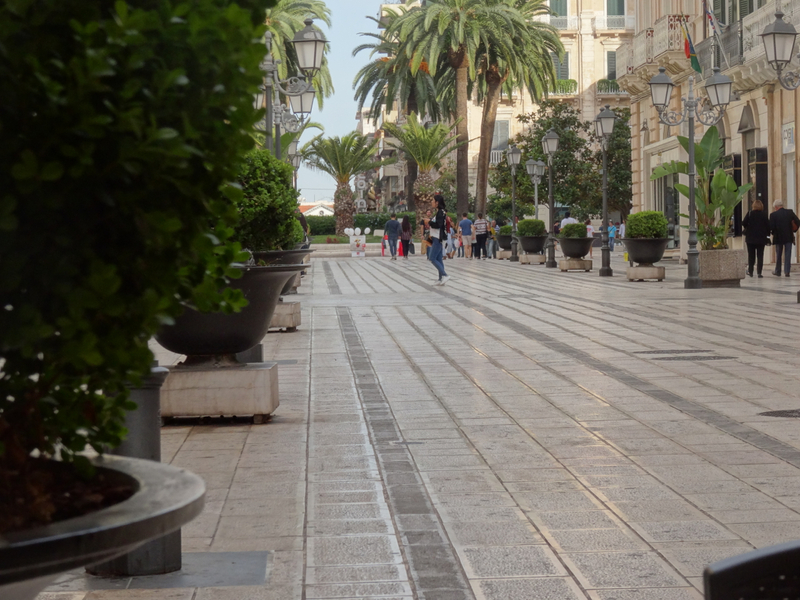 The pedestrianised shopping street is clean but quiet. So too is the park where we take the dog later that afternoon. The green space by the sea is ours for the evening apart from an alcoholic couple on a bench, and the occasional stroll of young sailors in clean white uniforms. The mood is listless rather than edgy in this end of town. As the light fades, we make our way back over the bridge towards the old city and the car. It is exactly where we left it but without its minder. We climb in and start our journey back towards the agriturismo. 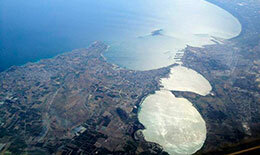 (taken from The Mar Piccolo of Taranto: an interesting marine ecosystem for the environmental problems studies). … and in need of help. 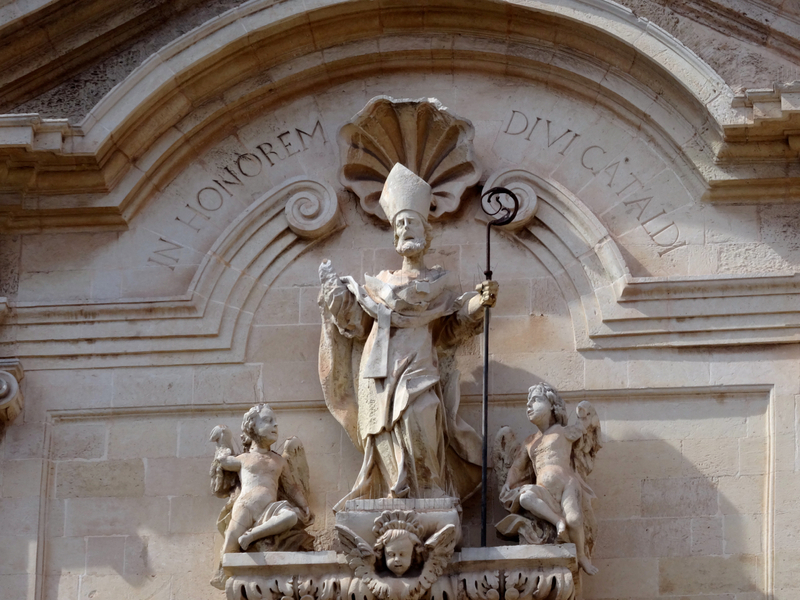 My thanks to Glynis Brown for her information on the church of San Cataldo in Palermo, in Sicily, which dates from the same period as the one in Taranto. 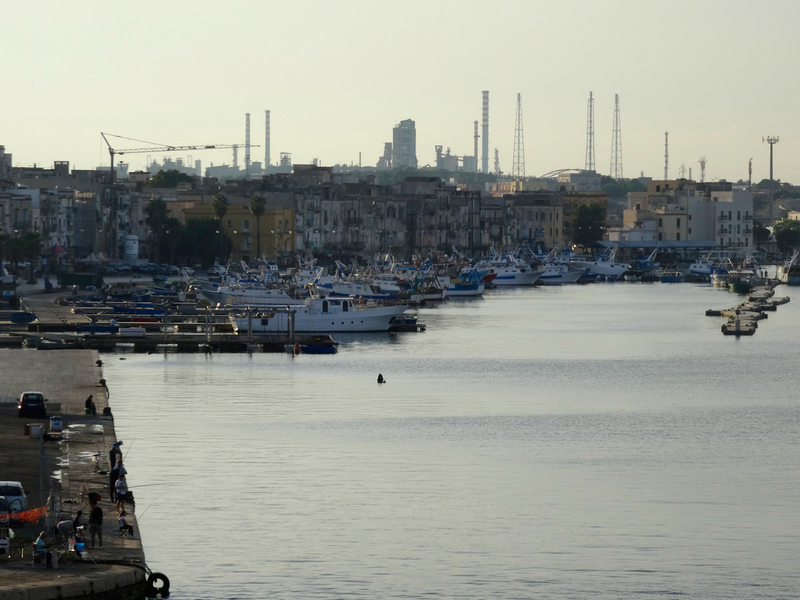 One of the many articles about the pollution in Taranto. 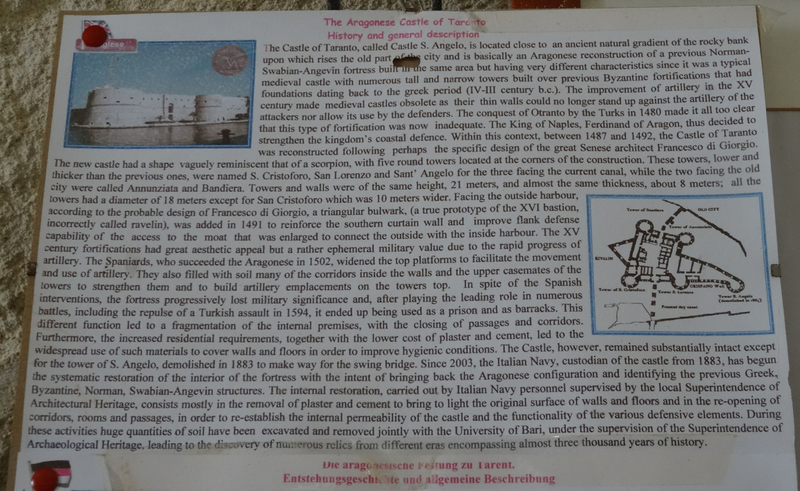 This entry was posted in Italy, Taranto and tagged Aragonese Castle, Battle of Taranto, ILVA, Italy, pollution, Puglia, San Cataldo, steel, Taranto. Bookmark the permalink. 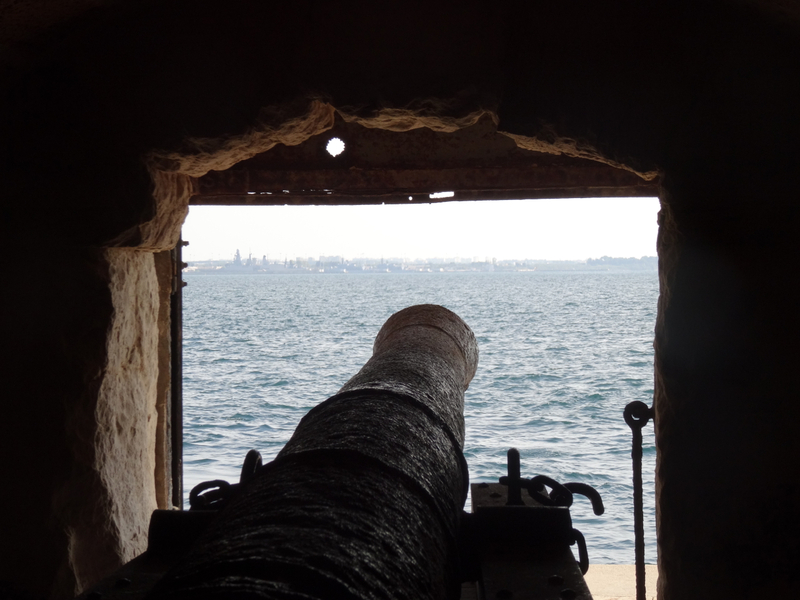 We visited the old town in Taranto earlier this month (August 2018), while we were on holiday near Martina Franca. We arrived just after a huge thunderstorm had rained down and washed the streets clean. We found it incredibly atmospheric, but it looked like it need a bit of love. 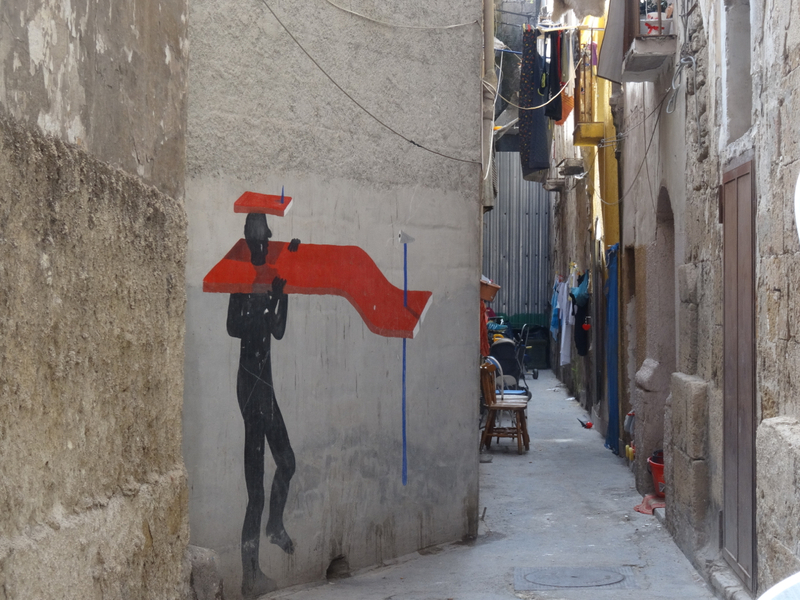 The various street art projects made a difference, and we loved walking through the very narrow streets. 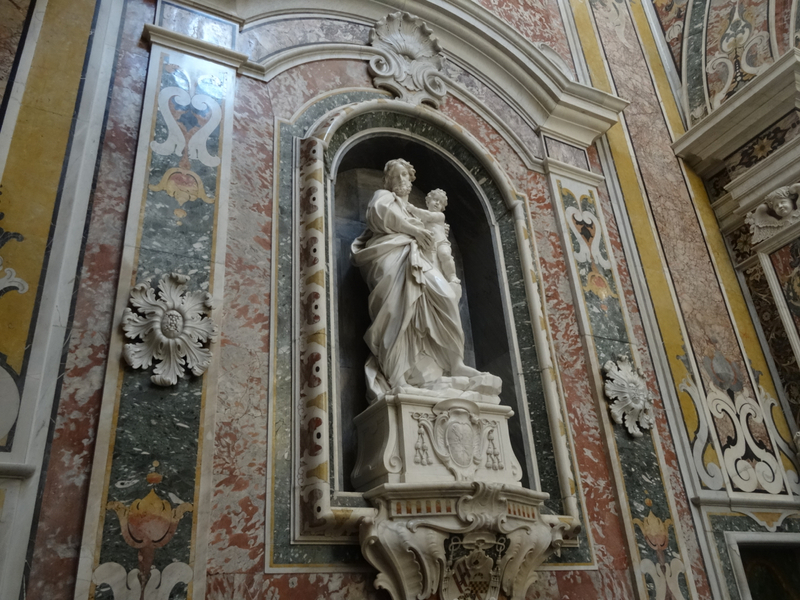 We also saw a wedding at the Cathedral of San Cataldo and had a lovely few quiet moments in the chapel. I’ve spoken to a few Italian colleagues about my visit, but they only know about the Ilva problem. 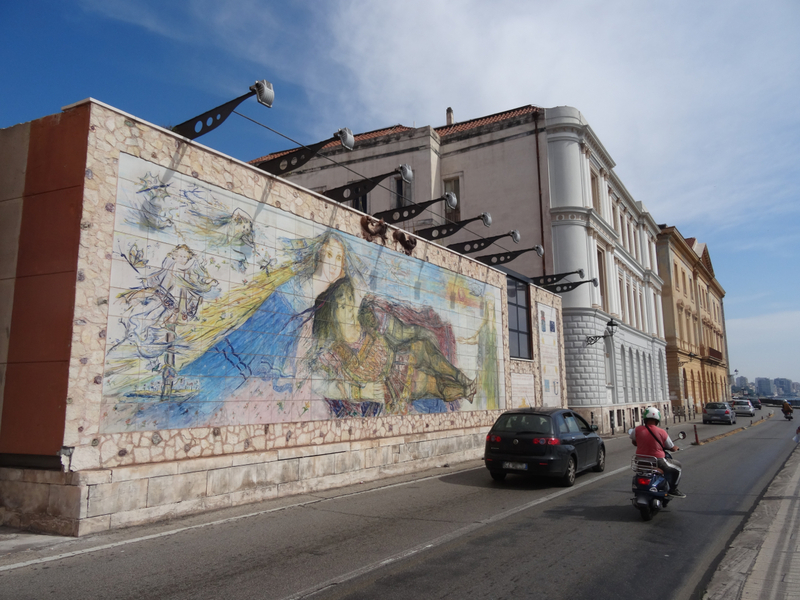 There is a fantastic city waiting to get vout, if only they could guarantee the health of the residents, invest in the maritime sectors and undertake a programme of renovation in the old town. Thank you for your comment. So pleased to hear that you visited Taranto. When I think back on our visit I remember a strong emotional response to the city that swung from despair to delight. The most miserable feeling was caused by the industrial works scaffolded around the city, but once inside we did get a sense of those trying to save it, and of how much there was worth saving. The castle and the tours around it were fantastic, and our walk through the old city, although uncertain in places, was memorable particularly for the lovely old church we found. It’s wonderful to hear that you enjoyed your time here. It is as you say a “fantastic city waiting to get out” – perhaps more visitors would encourage that journey. 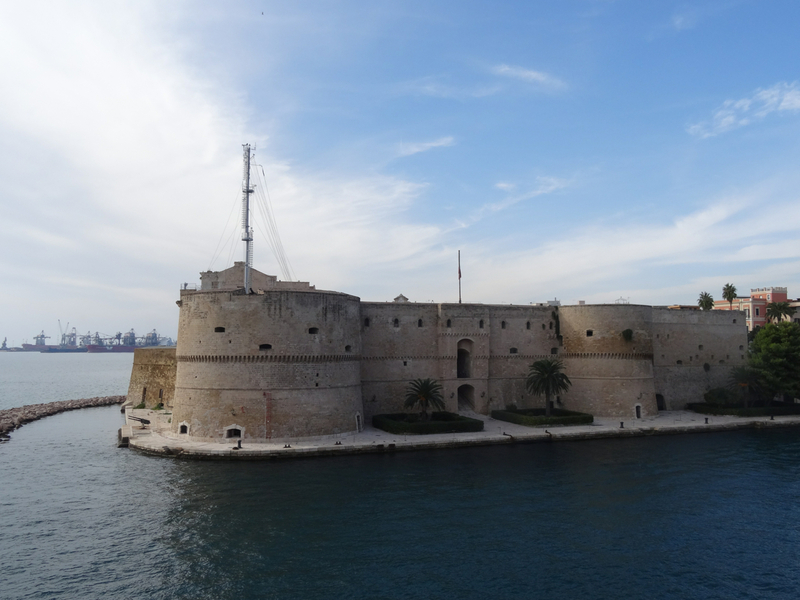 We visited Taranto Aug 2016 on our way back from Sicily. I had to stop and have their famous mussels, because a few years earlier we took a trip outlining the east coast down the heel then back home to Le Marche. Since i was on a diet at the time I ate mussels the whole time and they were different in every city we visited. BUT! The best were the ones called Cozze alla Taratina, so we stoped for lunch. First trying to find a place to park our camper that was not sketchy was a feat in it’s own. Then to find a place where I felt safe to eat was another one hahahah… did not want to get sick. But through a strange door we found we found the best little restaurant, i really had my doubts at first. Because the street were it was seemed abandoned and drug ridden (needles on the street). But I must confess that the same dish I had in a little seaside village in Puglia a few yeas earlier was much better. I am kinda a foodie and love trying dishes of the area. Your photos on this post were beautiful, I love street art and you did get the mussel farms in the water. I just saw them from a distance and it took me a min to figure out what it was in the bay. I do thank you for all the photos of the center because i don’t think I will ever get my husband to stop there again. 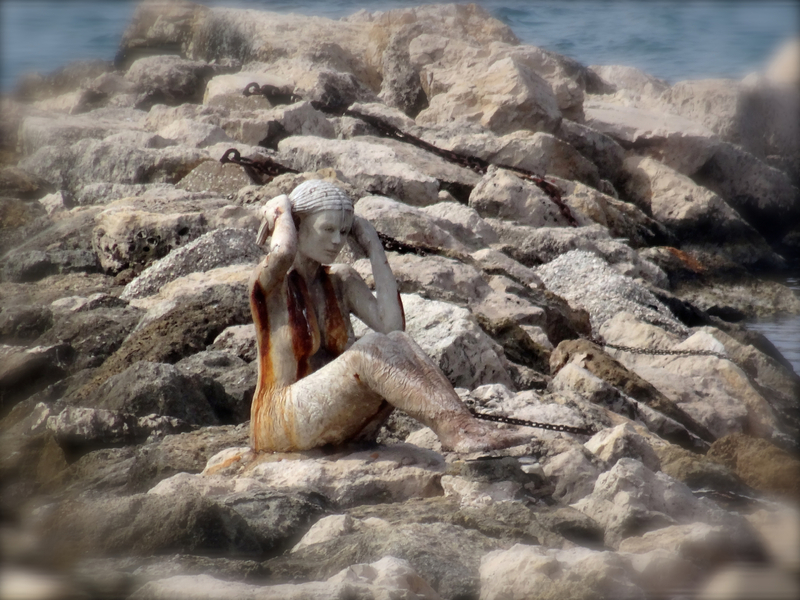 We passssssItFassst…..LOL…….. on our way to the beaches every year to Puglia. 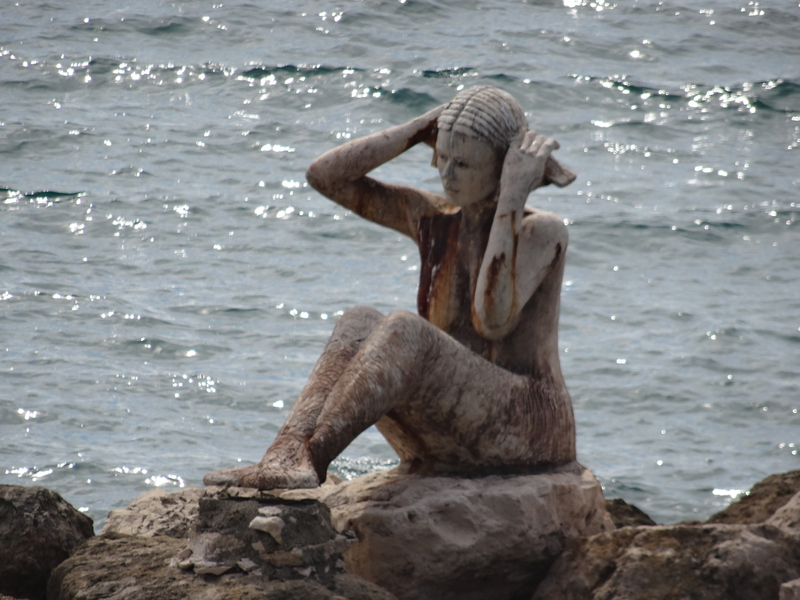 I missed the mermaids, hence we were in a rush to cross Italy to Polignano A Mare to meet up with my Aunt who was here in Italy on vacation. Thanks so much for this – I love hearing stories like this. I think we had a coffee in one bar and a hot chocolate in another. Did not try further than that. 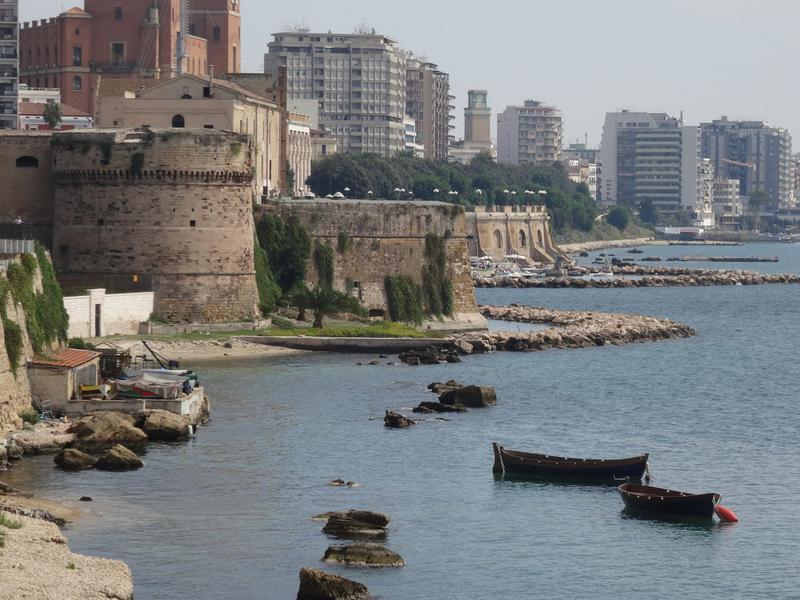 My heart breaks for Taranto, and the mussel and livestock farmers around the city. 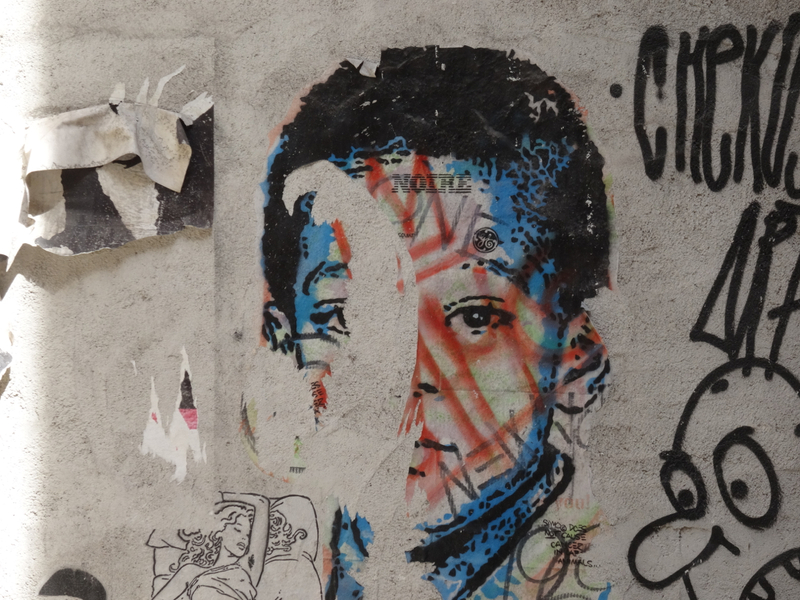 It seems people there, and in connected industries in the rest of Italy, are now trapped between the need for employment and the horrible legacy of what seems to be under supervised emissions from the steel works. I hope they can find a buyer soon and one with the resources to clean up the area and to make sure that the pollution problem is solved. From what I’ve read, and from your story, the mussels from Taranto were famous … and the location is wonderful.